This monster is Téa Gardner's favorite card. This card has a Trap counterpart, Mask of Darkness and an Monster counterpart, DUCKER Mobile Cannon. This monster may be a younger version of Disenchanter, due to their similar appearances, effects, and Japanese names (Magician of Faith is Saint Magician and Disenchanter is Saint Disenchanter). In the TCG, this card was Forbidden for thirteen formats before being Limited once more, which was the most of any card (surpassing the twelve of Black Luster Soldier - Envoy of the Beginning and Tsukuyomi). It was later surpassed by the OCG unbanning of Cyber-Stein, which was Forbidden for sixteen before becoming Limited in February 2014. The runes on this monster's staff are distorted versions of letters of the Latin alphabet. They spell MINARAI MAJISUAN, which means Apprentice Magician in Japanese. Dark Ruler Ha Des: Flip Effects and effects that activate in the Graveyard WILL be negated. 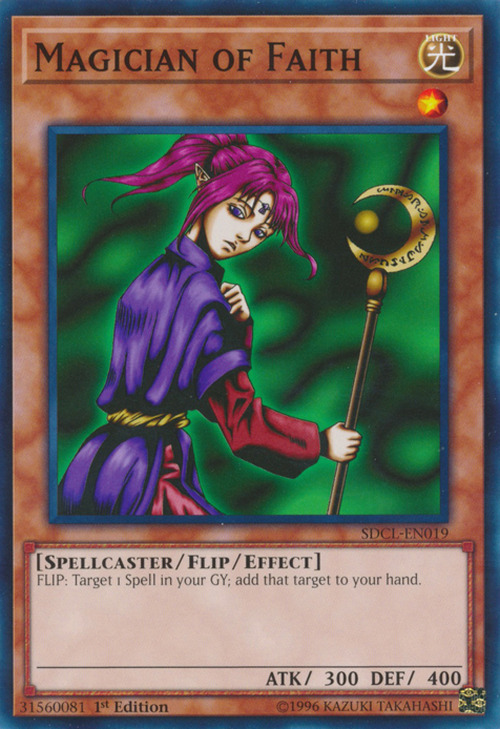 This includes"Magician of Faith"
Disappear: When a card that selects a card in the Graveyard as a target, such as"Magician of Faith"is activated, you may chain "Disappear" to remove the targeted card from play, and the "Monster Reborn", etc., will resolve without effect. This is because these cards select their target at activation, not resolution. Doomcaliber Knight: If an Effect Monster's effect that is not optional activates, even if it would not do anything when it resolves, it will still be negated by "Doomcaliber Knight". Example: Player A's face-down "Magician of Faith" is attacked by Player B's "Doomcaliber Knight" while Player A has no Spell Cards in his Graveyard. "Magician of Faith's" Flip Effect activates and "Doomcaliber Knight's" effect activates in a Chain to it. Necrovalley: "Necrovalley" WILL negate the effect of: "Magician of Faith"
Royal Writ of Taxation: "Activated" in the text of "Royal Writ of Taxation" means to activate a Spell or Trap Card, or to activate the effect of a Spell, Trap, or Effect Monster. So a face-down "Ojamagic" being destroyed, the effect of an already face-up "Ultimate Offering" being activated, or the Flip Effect of a "Magician of Faith" activating would all cause "Royal Writ of Taxation's" effect to be applied. The End of Anubis: "The End of Anubis" WILL negate the effects of "Magician of Faith"